JUNIOR MAX ZAFRANCO donates a pair of shoes to the Dewey Street collection box. Shoe donations are due on Dec. 6. The Loyola Facilities staff started participating in the Shoes for Santa Drive which donates shoes to school age children three years ago. The drive is organized by the Los Angeles Police Department and is participated in throughout Los Angeles County. The Shoes for Santa Drive ends on Dec. 15 and is overseen by the Olympic LAPD Station. While the Olympic branch stops collecting shoes on Dec. 15, Loyola is required to turn in all collected shoes by Dec. 6. 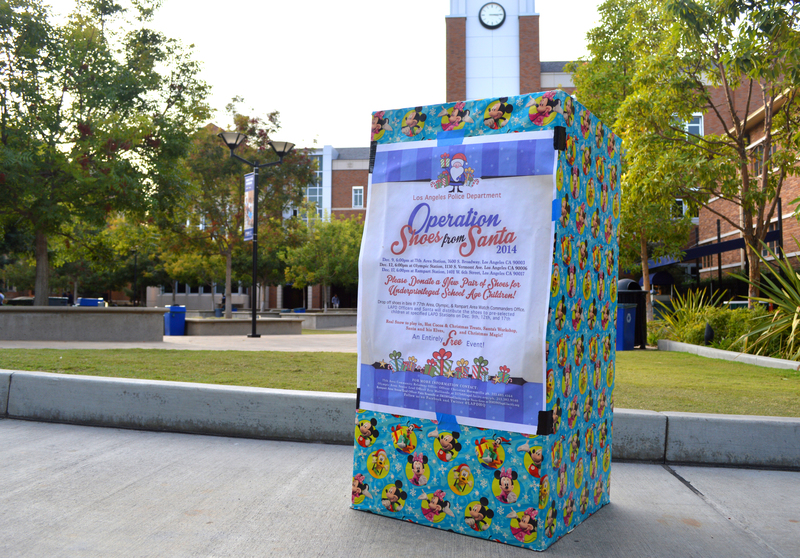 The collection boxes can be found at all major entrances to the school, namely the Front Circle, the Berendo entrance, the Dewey entrance and the Campus Ministry office. People in need of shoes sign up through the LAPD; however, not all those who sign up receive shoes. The LAPD can only distribute as many shoes as there are donations. To collect more donations, the LAPD reaches out to the local community to adopt the program and help the LAPD reach its goal of giving shoes to all people who sign up for the program. While the goal is difficult to be achieved, the drive to collect as many shoes as possible is beneficial to the LAPD and their cause. Students are encouraged by the Facilities staff to support the cause as much as possible. While students are the main contributors for the drive, many faculty and staff members donate shoes as well. One anonymous staff member has given twenty or more shoes consecutively for the past few years. In order to achieve the LAPD’s goal, the student body is encouraged to be active in supporting the cause and spreading the word. The Shoes for Santa Drive supports children in need at the limited expense of donors. Previous ArticleDelegates lobby for social justice in Washington, D.C.